Ever since the Disney movie, The Princess and the Frog, came out, I've been wondering what it was like. I love Disney Animated Classic movies and I was excited to see that they were making a new princess character. Of course, it came out and there was a lot of hype but I hadn't run across any reviews of it that would give away plot or tell me very much about it. My question about it has been over how much dark magic was involved in the telling of this story. After not finding the information I wanted, I figured I might as well just bite the bullet and watch the movie for myself. BUT! I discovered that the Disney movie was "inspired" by the book of the same title by E.D. Baker. 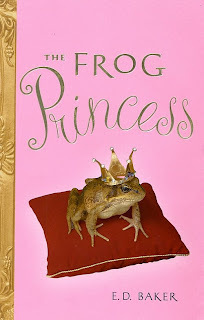 Apparently there's a whole series of Frog Princess books but I, being the clueless person that I sometimes am, wasn't aware of it. I opened up The Frog Princess , by E.D. Baker not really knowing where the story was going to take me. As you likely suspected, we have a frog on our hands who used to be a handsome and full-of-himself young prince. He insults a witch who turns him into a frog. He needs a princess to kiss him and so we meet up with the fourteen-year-old princess, Emeralda (or "Emma" for short.) Emeralda likes to spend her time hanging out in the local swamp which is where she meets Prince Eadric - the frog. Emeralda's mother has invited Prince Jorge to come calling at the castle and Emma, wanting nothing to do with the stuck-up Prince Jorge, finds refuge in the swap. No one goes to the swamp but Emma and her witch Aunt Grassina. It is here, in a fit of frustration, that she glumly offers to kiss the Frog Prince Eadric to turn him back into a human. Only, unbeknowst to Emma, her Aunt Grassina has placed a charmed bracelet on her hand that is meant to reverse spells which are cast against her. Grassina's hope was to save Emma from befalling any horrid spells but in this case, because she was wearing a spell reversal bracelet, upon kissing the prince, the spell reverts back to her and she becomes a frog herself. The rest of the book tells the adventures Eadric and Emma have while trying to reverse the spells that have been cast upon them so that they can be human again. So on the one hand, I get the point that The Frog Princess is supposed to be a light-hearted fairy tale, re-told. On the other hand, I felt like E.D. Baker didn't do a very good job at defining what is good and bad about the practice of magic and so it's hard to know for fact who is right or wrong in their fictionalized use of it. Instead, we are made to like the individual characters in this book based on our own feelings or emotions towards them. Eadric is caddish at one time, yes, but he really has a hero of a frog's heart. Emma is a clumsy princess who turns out to be quite strong and sure of herself - a regular brave woman of the world (and a witch-in-training herself, by the way.) Emma's Aunt Grassina wants what is best for Emma. Emma's mother is a mean spirited female who you hate because she wants to force Emma into a relationship with Prince Jorge. There are a couple of other encounters with witches that leave you wondering what is good or bad about them. The whole thing is just kinda confusing. It's an emotional tale which I wouldn't mind so much in good, clean fun. But, as I said, when you start adding all of these elements of magic, witches spells and whatnot- you really need to make your position clear on who is good and who is evil or else I'm not inclined to offer up a book for recommendation. Frankly, I'm not surprised Disney picked up on the tale. With the magic cleaned up a bit, and a clear distinction between darkness and light, good and evil, then I'd probably like this story a whole lot more. I'm not inclined to read anymore in the series, and I wouldn't recommend them as entertainment because Baker refuses me the luxury of being entertained. I have to think too hard about what's right or wrong to merely sit back and enjoy the story if that makes sense. I think the idea is good. I'm a fan of fairy tales and the re-telling of them. Some can be quite enjoyable. Baker writes very well and I was drawn into the story. I even chuckled my way along through parts of it. I also was left with a string of question marks surrounding the use of magic which makes me unable to say, "Go. Read this!" 2. I haven't been able to find out what I want to know about the story from anyone else. 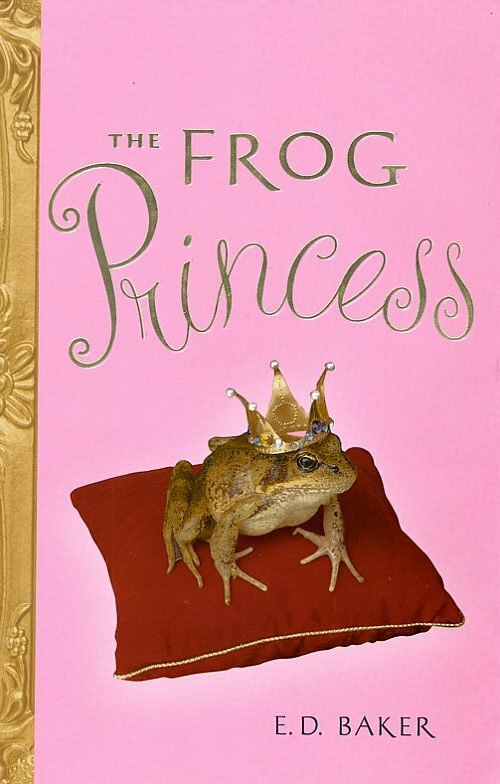 If you know me well, consider my reading of The Frog Princess a cultural study of sorts. Then tomorrow you can find out what I thought about the Disney-fied version of this story which I went out and rented to watch with my husband. Despite the fact that I can't really recommend this book, I do want to say thanks to Bloomsbury Kids for offering me the opportunity to read it. It was really very generous of them and I'm grateful. Thanks for this review. You and I tend to agree on these issues so you've saved me the time, money and energy of checking it out on my own. I'm like you - I want good and evil to be clearly defined. I was just talking about witches-Harry Potter, Narnia...-yesterday with a dear friend. I explained that my I tend to be conservative...though not fully against magic in stories. But I've never been able to figure out when it's okay and when it isn't. THANK YOU...The difference is exactly what you said...there needs to be a clear distinction between good and bad. Clear. Annette's point is interesting. That's exactly why I haven't had a problem with Harry Potter -- because I think at the core it IS about good vs. evil. I was aware of the books. They are very popular at the elem library where I volunteer, but I didn't know that the movie was sort of loosely based on them. I was clueless to the variety of frog/princess stories so appreciated that part of your post. Saw the movie w/my sis and we both agreed it was NOT rated appropriately, soft-balled an otherwise very serious and significant spiritual issue with the whole voodoo thing, and while the animation was good and the music fun, everything else was just bad. Annette & Jennifer - Yes, I'm thinking that after I delve into Narnia this summer, I'm going to give Harry another go. I'm almost there. Not totally quite. But! I've been riding the fence for so long on Harry, I feel like it's time to read it and render an opinion. Stephanie - Yes, I can imagine what you thought of it! I just found your blog, and I like what I see. I read this book about a year ago, so I don't remember it that well. However, I do remember that I wasn't impressed. For a fairy tale, it was...boring. I'm pretty sure I remember being confused by the witches as well. She's a witch. Is she good? Bad? Should I be leary of her? Root for her? Ugh, I am not interested in the rest of the series either. Oh yes, I remember thinking, "How many of these books do I have to read before I get some answers about good and bad?"